The Clintons’ pet cat Socks has died at age 20. Socks had been staying with Betty Currie and died after a battle with throat cancer. “Socks brought much happiness to Chelsea and us over the years, and enjoyment to kids and cat lovers everywhere,” the Clintons said in a statement. Currie, the president’s personal secretary, and her husband, Bob, took over care of Socks after the Clintons left the White House. 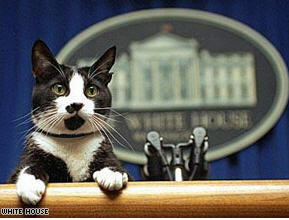 It was near their home in Maryland that Socks was euthanized. “He could no longer stand and wasn’t eating,” according to family friend and presidential historian Barry Landau. Landau said Socks had become very attached to Currie at the White House and would curl up next to her in a blue chair in Currie’s office, just outside the Oval Office. CNN says Chelsea Clinton adopted Socks when he was a stray back when Bill Clinton was still governor of Arkansas.